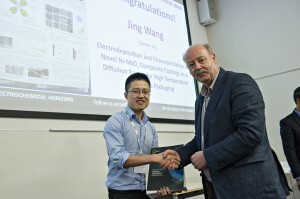 Congratulations to Jing Wang who was recently awarded a PCCP poster prize at the ‘Electrochem2014′ conference which took place at Loughborough Univeristy, UK from 7th–9th September. Jing Wang’s poster was entitled ‘Electrodeposition and Characterisation of Novel Ni-NbOx Composite Coatings as a Diffusion Barrier for High Temperature Electronics Packaging’ and he was awarded the prize by Professor Rob Hillman, PCCP Advisory Board member. The ‘Electrochem’ conference series has emerged as an established annual UK & Ireland event, where a cross-disciplinary range of electrochemistry, fundamental and applied, is on show with a particular view on broadening exchange of knowledge, providing information about the latest research developments, linking academia to industry and suppliers, and engaging with the next generation of electrochemists and electrochemical entrepreneurs. PCCP will be awarding more Poster Prizes next year, so please do let us know of any suitable conferences which PCCP could sponsor in 2015.